You'll never believe my luck on the upcoming 21st! The missing third mouseketeer will be back in town for F1 weekend and some MAJOR shenanigans. I can hardly wait! My September is seriously swinging along nicely, and yours will be too! If you just click click for more, there's FABULOUS things in store. The following midweek will be dominated by none other than the Diane von Furstenberg Fall Preview (on the 18th) - it seems to be a big month for fashion from the USofA! AND THEN THERE IS BABAR'S BIRTHDAY! OooOoOoOoOohhh yeah. Though we'll probably wait for the arrival of our missing mouseketeer on the 21st before we boogie on down and dance the night awayyyyyyyyyyy throughout Race Weekend. Race Day itself will see us lounging in the grand stands craning our necks about for a better view. To be entirely honest, I mostly go for the free booze and fantastic concert line up - that's the really good stuff :) Still debating who to support this year. Maybe Mercedes McLaren. But remember my friends! Though you will be drinking, and the racers will be driving, you really shouldn't mix the two. That's my public service announcement for the month where we celebrate fast cars and fancy parties! My September will come to a smooth close with a concert by Singapore's very own singing sensation, Sarah Cheng-De Winne (Esplanade, 28th Sept). She's been singing since she was a wee kid, and having witnessed her voice develop over the years through school, I'm so very impressed she's decided to do what she does best and has such incredible passion for. Tickets available through Sistic. There is also a super secret something brewing that I'm just dying to share with the lot of you, but you're gonna have to keep those pants on and wait till I'm given the go ahead to spill the beans :) You'll love it though. I'd make a bet on it. As you can imagine, sleeping isn't on the agenda for this Swinging September! Who says there's nothing to do in sunny old Singapore? Want to win some tickets? Of course you do! Freebies are always fun. 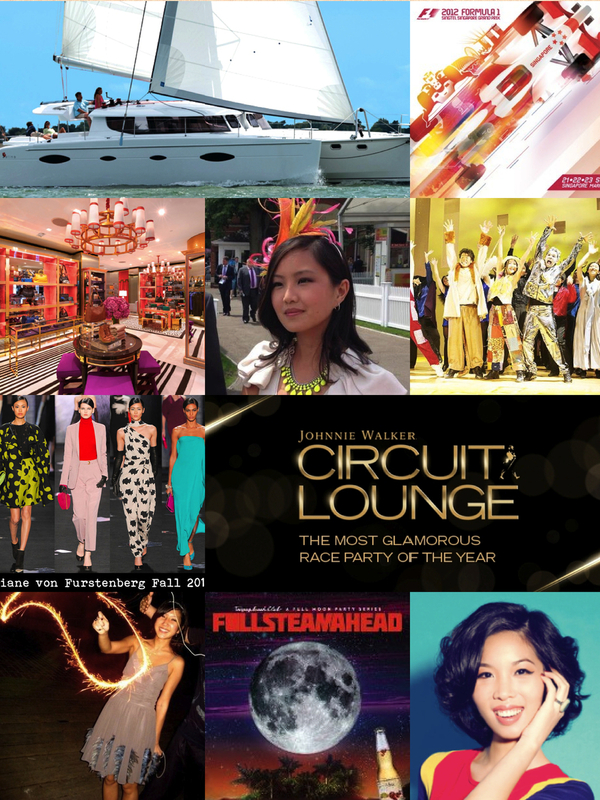 Especially if the prize is tickets to the party of Race Weekend at the Johnnie Walker Circuit Lounge. Qn. What's your most memorable experience with Johnnie Walker? Most interesting/hilarious/make-me-crap-my-pants response will win the tickets :) In exchange, I'll tell you my most memorable moment with Johnnie Walker. Keep. On. Walking.